New Tile Designs. Achieving with EFI Cretaprint Technology. Large companies with the capital behind them are making investments into digital decoration technologies. Tile manufacturers located worldwide are notably choosing to adapt inkjet into their facilities. This includes companies designing tiles found in bathrooms to kitchen backsplashes and everything in between. Compared to traditional methods of decorating tile, which include screenprinting and flexography, digital printing technologies broaden a manufacturer’s product portfolio. Instead of a step-and-repeat process, digital allows for a randomized design. Digital image capture snaps a close up of a natural element like a rock and a more realistic stone pattern can be printed directly to the tile. Digitally printing tiles also makes short runs a more cost-effective option. This provides the ability to quickly react to changing sales cycles or increased demand in a specific product. Less inventory is kept in warehouses as a more print-on-demand or just-in-time delivery method is adopted. Above: Oceano of China, recently expanded its digital tile decoration capabilities by acquiring nine EFI Cretaprint printers. Foshan Oceano Ceramics Co., Ltd. of Foshan, Guangdong, China is a ceramic tile manufacturer who adopted digital printing into its production facilities early on. According to the company profile on its website, it “believes tiles should be distinctive, combinable, and multi-functional, with lasting design that inspires individual or commercial use and expression.” This philosophy aligns with the company’s continued commitment to evolving its manufacturing and decorating practices. Founded in 1998, Oceano offers polished, polished glaze, polished crystal, and antique brick tiles, as well as ceramic accessories. It employs over 200 staff members at several plants located throughout China. It recently expanded its digital ceramic tile decoration capabilities by adding nine EFI Cretaprint printers equipped with Cretacolor inks to its plants in Guangxi and Jiangxi. They are used to produce floor and porcelain tiles. Part of the reason Oceano purchased nine new printers was to drive its quest to be at the forefront of leading décor trends. “EFI is a valued and trusted supplier of advanced digital technologies that help us be more innovative and flexible in meeting customer demand for new designs. This expansion of our longstanding partnership with EFI will help us continue to expand while staying on the leading edge of design,” shares Mr. Shaoji Pang, VP, Oceano. 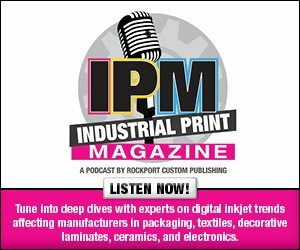 “EFI is excited to collaborate with Oceano on future projects that will help the company further expand its market presence, while also giving the company the ability to streamline its processes for designing and producing new tile designs,” says José Luis Ramón Moreno, VP/GM, EFI Industrial Printing. The EFI digital tile printer portfolio was recently added to in May 2018 with the announcement of the 5th generation of Cretaprint printers. Devices are available in widths ranging from 710 to 1,440 millimeters and equipped with six to 12 printing bars. EFI developed the e·D5 printhead specifically for these new models. It offers plug-and-play capabilities and a new nozzle geometry to ensure increased print uniformity. e·D5 is developed with a custom-tailored waveform for EFI Cretacolor ceramic inks. In addition, the EFI Fiery proServer Color Management for Ceramics creates high-quality separations for decreased ink consumption thanks to a new algorithm developed for the printhead. The ink system on the 5th generation printers also went through an update. It now features full recirculation, zero sediments, and full temperature management. In response to ID printing requests, the newest devices allow users to create an extra print with data and information relevant when printing slabs for master tiles and production control, traceability, and machine adjustment and monitoring.